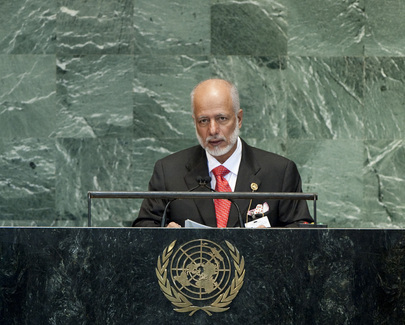 YOUSEF BIN ALAWI BIN ABDULLAH, Minister Responsible for Foreign Affairs of Oman, calling on his “brothers in Syria” to renounce violence and enter into a political process to end the crisis, called on the Security Council to reach a unified position on the Syrian crisis “away from any political contradiction and without bias to any party,” that would usher in inclusive political dialogue for that purpose. The principles laid out by the Action Group for Syria in Geneva could be used as a guideline in that respect, he stated, adding that the time had come for collective action to preserve the security, stability and development of all the countries in the Middle East. In that light, he said, the role of the United Nations in relation to the Question of Palestine should change “from managing the crisis to seriously searching for a just and lasting comprehensive political solution,” which would take into account the interest of both parties and lead to two States living side by side. From that standpoint, he supported the application of Palestine to become a non-member state of the United Nations, hoping it would usher in a new phase in negotiations. He expressed the hope that the upcoming Treaty on the Non-Proliferation of Nuclear Weapons (NPT) review conference will be able to declare the establishment of a Middle East zone free of weapons of mass destruction. On Somalia, he welcomed political progress there and called on the international community to provide political, economic and humanitarian assistance to the people, urging Somalis of all political and tribal affiliations to reject violence, cease hostilities, engage in national dialogue and place the interests of the nation above their own. Noting the location of his country on the Arabian Sea, he reconfirmed its support for international efforts to eradicate piracy and armed robbery against merchant vessels in that sea and the Indian Ocean. Condemning the recent video that slandered the Prophet Muhammad while rejecting the escalation of violence that followed its dissemination, he said it was incumbent on the United Nations to adopt international legislation that would “hold accountable those responsible” for any deliberate abuse of and slander of the sanctity of people and their beliefs. Turning to threats to food security, he said that among remedies worth exploring were the establishment of a global food reserve system to meet shortages, with reserve centres in several continents managed through a targeted international fund. He suggested that the Food and Agricultural Organization conduct a study of the matter and encouraged industrialized countries to support more research towards innovative solutions to keep pace with the steady increase in the global demand for food. Describing his country’s progress in the areas of health, public services and sustainable development, he looked forward to international cooperation in implementing the results of the Rio+20 conference. He also stressed progress Oman had made in safeguarding human rights, fighting human trafficking, acceding to international treaties and empowering the Oman Council, granting it wide legislative powers.